Who knew, when I started writing about the Swiss cheese master Tinguely last November, that cheese would become the star of its own foreign policy drama? And yet, here we are. Type “cheese” and “Russia” into twitter’s search field and find a slew of half serious, half ironic stories about Russia’s turn against the evils of Parmesan. Type “сыр” in and find a slew of often pretty funny memes about it (my favorite? Melisandre hovering over Putin’s shoulder, urging him to burn the cheese). Why cheese? Is cheese just a comedy food? (A quick internet search brings up the fact that both Phyllis Diller and Lucille Ball had early spots featuring cheese as comedy props.) Is it because some of us associate it with smiling? Or because it’s what the moon is made of? Type it enough and it’s definitely one of those words that gets weirder and weirder until it stops seeming like a real word. Cheese. Cheese. Cheese. I think that’s still true. 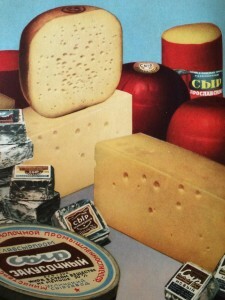 Cheese was and is hugely symbolic, and particularly symbolic of Russia’s relationship with Europe. It’s not that there’s no Russian produced cheese, of course. There is—the famous Book of Tasty and Healthy Food, the culinary bible of the post-war Soviet Union, had a beautiful image of the many cheeses produced there. Its image (and various smaller ones, too) emphasized the mass production of cheese, the gooey processed cheeses that Anya von Bremzen recalls in her memoir of Soviet kitchens (and that are one of my most vivid memories of my first trip to the brand new Russian Federation in 1992), the big long logs of cheese to be held in glass cases and thereby given a certain cachet of their own. But bringing back the bries and the cheddars, the parmesans and the camemberts, was one of the post-Soviet signs of a return to participation in the wider world, a return to normalcy. And here’s where I get a bit uncomfortable. I’ve always been a little leery of writing about contemporary events. I’m too aware that my base of reference is always anecdotal, and sometimes rumor, and never complete. But that word, “normal,” seems to me important here. I’ve heard that word used in Russia to express a hope for a “normal life.” If I’m interpreting it correctly—and I may not be—normal here is opposed to a combination of the Soviet era and the 1990s. It’s opposed to the closed nature of the Soviet era, and to the economic and social uncertainty of the 1990s. It seeks stability for oneself and one’s family, made possible by a reliable government, and still with the ability to travel to Europe, to be part of a larger world. That makes the cheese all the more symbolic in a way that has made its burning open to so much attention. I suppose cheese has been a particular focus of state attention in part on populist grounds. By focusing its attack on cheese, it’s not attacking a necessity of life—I don’t think anyone actually needs cheese to live (though I am perfectly happy to agree that one needs cheese to live well). Attacking cheese could be read as an anti-elitist move, an attack on this snobby, imported luxury. That certainly fits with other current rhetorical turns—and, weirdly, with the rhetoric of the late-eighteenth and nineteenth centuries. I think that misstates something, though—it forgets about the goal of having a “normal” life. I don’t know that I’d go so far as to say that imported cheese is the ultimate symbol of normalcy, but I think it is, or was, a very real part of that world of normal comfort. Nor would I say that this attack has been an attack too far (how ridiculous would it be to predict that an attack on cheese would bring down a country or a government when the annexation of Crimea didn’t?). The New York Times editorial I linked to above ends with “Fooling his people may buy Mr. Putin time, and Russians are famously capable of sacrifice.” “Fooling” doesn’t seem the right word to me at all here, or if it’s the intention, it’s an underestimation of “Russians” (hey, also, NYTimes, you’re kind of underestimating them, too). Instead, it seems like it’s a misreading of the rhetoric, of the optics, of the situation. There’ve been other hints at discord, or at least disruption, at the top of the Russian political structure. Is the choice of cheese as a target an indication of that? Or maybe I’m reaching. Maybe it’s pure absurdity, with nothing profound about it. In that case, the ballad “The Death of Parmesan” seems an appropriate end. This entry was posted in Current events in the Putin Era, Imperial Russia. Bookmark the permalink.